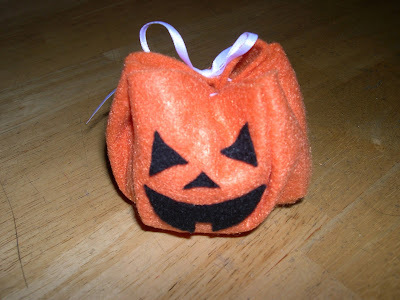 Hand out the cutest treats on the block by making these quick and easy Jack-O-Lantern candy favor bags that will have trick-or-treaters grinning from ear to costumed ear. Trace a dessert plate or a large bowl to create an 8” circle on orange felt. Cut 3/8” slits 2 centimeters from the edge and about 2” apart all the way around the circle. Cut a length of ribbon 13” long. Thread the ribbon through the slits. Fill the jack-o-lantern with candy and tie the ribbon in a bow. Cut out and glue on the eyes, nose and mouth, for neat little Halloween treasures. Copyright © 2010 by Ruth Schiffmann. All rights reserved.